In my late teens and early 20s I was wrestling with many questions about what I believed. I had several challenges to my Christian faith that ranged from the philosophical to the scientific to the historical. One of the challenges that would not go away, due to some college professors and some friends, was the challenge to the historical Jesus and the gospels. Of all the worldviews one can hold, Christianity can be easily falsified by simply demonstrating that a single person did not actually exist in history: Jesus of Nazareth. Did he really exist in history? If so, what can we really know about him? Does that match was the Bible claims? Was there any evidence that Jesus actually came back to life after being dead? How do we know that the right books were included in the New Testament? Why not the books known as the "Gnostic Gospels" too? When I was looking for some answers to these questions, I came across the work of Dr. Gary Habermas. 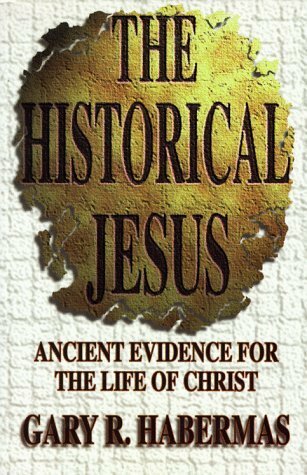 The first book of his that I read was the one I present to you today: The Historical Jesus: Ancient Evidence for the Life of Christ. Reading through this book provided the answers to more than just the questions that I was asking but also to questions that I did not know would eventually come too. This was well over a decade ago, and it is time for me to revisit the book and publish a proper review of this most important work. The review will follow my usual chapter-by-chapter summary style and conclude with my thoughts and specific recommendations. In the introductory chapter, Habermas introduces the reader to the historical quest to discover the historical Jesus. He goes over some of the history of the studies, what different scholars proposed at different times regarding Jesus' historicity and how to handle the different miracle-claims of the New Testament. He describes the popularity of the liberal approaches of the fictitious lives of Jesus and the idea that the gospel accounts were purely mythologies in the eighteenth and nineteenth centuries and the deemphasizing of the historical Jesus in the early twentieth century. He brings the reader "up to speed" by describing the re-emphasis on the necessity of the historical Jesus near the mid-1900s and onto today. While most scholars today recognize that Jesus was a historical figure, there is a small group that still does not. Habermas reminds the reader that the popularity of a particular position does not provide legitimate evidence, in or of itself, for the historicity of Jesus, so this book will examine the evidence that has convinced the majority of scholars that the historical Jesus existed, and it will make the case that the historical Jesus is the Jesus of Christianity. Chapter 2: Did Jesus Ever Live? Even though most scholars reject the idea that Jesus never lived, the idea that he did should not be taken for granted in an investigation about the historical Jesus. Habermas addresses the two most common theories to explain the records of the New Testament without Jesus living in history. The first view addressed is that of G.A. Wells, while the second view is more modest and is promoted by Michael Martin. G.A. Wells dates the gospels in the late first century to early second, and Paul's letters earlier. He believes that the gospels were too late to contain accurate historical information, so he leans on Paul for historical information of Jesus. He holds that Paul's writings include very little information about the historical Jesus and concludes that Paul neither knew or cared about the historical Jesus. Wells believes that, at best, Jesus was a much earlier historical figure that legend grew around, and at worst, Jesus was based upon pagan mythologies. Of the many issues with Wells' view, Habermas address five of them. He provides textual and historical evidence that Wells is incorrect on issues of Paul's lack of record of and/or concern with historical information about Jesus, the idea that Jesus may have lived prior to the first century AD, Jesus' connection to pagan mythologies, the late dating of the gospels, and his overall historical methodology. Recognizing the failure of the more extreme views of G.A. Wells, Michael Martin softens some of the positions to make them more compatible with the textual and historical evidence. For instance, Martin grants that some historical data can be gleaned from the Pauline epistles, but he does not allow for much. He does retain the late dating of the gospels, and he adds that extrabiblical sources either do not contain historical data of the historical Jesus or that the information is inaccurate. Habermas addresses each of these claims briefly as they were either addressed in the section on G.A. Wells or will be covered in greater detail later in the book. Even though the extreme view that Jesus never existed in history is widely rejected among scholars, many do still believe that what can be known about the Jesus of history is greatly limited. This view is born out in a few different ways. Habermas describes these various attempts to limit historical investigation of the Jesus of history and demonstrates how each of them fails, thus leaving wide open an historical investigation of the life of Jesus as a person that actually existed in the past. The first view that Habermas addresses is the idea that the gospels record what early Christians believed about Jesus, not necessarily what actually happened. This view removes the gospels from historical investigation because they would not be claiming to record what actually happened but just what a group of people believed. Habermas explains that this view fails on four accounts. The first is that it removes all historical grounding for the origin of Christianity (from where did the recorded beliefs come?). The second is that without even attempting to investigate the claims of the gospels as historical claims, it rejects them as mythological (how did they come to the conclusion that the gospels recorded beliefs and not events?). The third is that the view assumes that, unique among all historical authors, the early Christians' records were to not be trusted to be true because they believed their records to be true (how does belief of an event necessitate an incorrect recording of that event?). And fourth, the view holds that due to the few copies of the gospels, we cannot trust that we have what the early Christians originally wrote (given the mountain of copies compared to other ancient writings, how then are we to trust that we know what other ancient writers originally wrote?). Another optional view is that while the gospels do record historical events, the only historical events that are correct are ones that are not miraculous. Habermas addresses four ways in which this view fails as well. The first here is that it presumes to reject the miracle claims without even investigating whether they happened or not. Such a priori assertions exhibit neither good scientific investigation nor good historical investigation. The second problem is that the view does not even allow for the investigation of miraculous events because they are miraculous. However, if an event takes place in reality, that it happened can be investigated independently of its source or cause. Third, when the second problem is removed, investigation of Jesus' being seen after his death and burial is well established, and no naturalistic explanation can account for the event. If no naturalistic explanation can account for an event that has been historically investigated and confirmed happened, then only a non-natural or super-natural explanation (miracle) is possible, thus miraculous events were recorded in the gospels. Fourth, if it can be established that Jesus did rise from the dead (to be investigated later in the book), then his metaphysical (and theological) teachings and actions must be considered relevant to the reader. Many scholars grant the failures of the views critiqued in the previous chapter, yet they still wish to reject the Christian worldview. So many have attempted to reinterpret the historically established events of Jesus' life. Habermas investigates these attempts in this fourth chapter. The majority of these proposed alternate lives of Jesus depend upon the idea that Jesus did not die by crucifixion as recorded in the gospels. Many offer that Jesus merely appeared to be dead and after being removed from the cross and placed in the tomb, he recovered enough to escape and went on to live a secret life. While there are numerous versions of this "swoon" theory, all of them fail on three major accounts. The first is that Roman crucifixion was extremely brutal and would have left Jesus in such horrific condition that he could not escape from a sealed tomb, much less, convince anyone he had "overcome" death. Second, crucifixion caused death by asphyxiation due to the inability to breathe while hanging from the cross when the muscles are relaxed. This means that it was not possible to appear dead on the cross without actually being dead. Third, the Roman executioners ensured Jesus' death by thrusting the spear into his side and puncturing his heart. Even if faking death on the cross was possible, this final blow would have killed Jesus immediately. Because of these reasons, the swoon theories have all been rejected by scholars. Even though the failure of this foundation of the alternate lives of Jesus theories is enough to reject those theories, they fail on other accounts as well. These theories, of course, come in many different versions. Some hold that the Gospels and Paul recorded incorrect information and the real events of Jesus post-crucifixion life is unknown, and others hold that Jesus traveled to other places in the world. All of the theories fail for multiple reasons. They contradict already established historical records (the Gospels). They appear late. They have no historical grounds. And the arguments require multiple fallacies to come to their conclusions. Along with those commonly held failures, Habermas also discusses several additional failures that are unique to the various theories. He ends by stating that, because of the incredible list of reasons that these theories fail, they are not taken seriously by historians today, but they needed to be addressed due to their continual recurrence within popular culture. One of the more popular challenges in historical Jesus studies comes from the discovery of several texts dated from the mid-to-late second century to the early third century. These are the Gnostic writings, with The Gospel of Thomas probably being the most familiar to the public. Some scholars believe that these text raise a power challenge against orthodox teachings about Jesus due to their traditionally early dating. The Gospel of Thomas is dated as early as AD 140 (all the others are date much later). Supporters of the Gnostic view attempt to date the tradition that is contained within the Gospel of Thomas in the first century, and they contend that due to the early sourcing, it should at least be held on the same authoritative level as the Gospels. Now, the significance of this dating is that, if the dating is correct, then it is possible that there were multiple expressions of Christianity at the time. The competing claim is that the New Testament that we have today is incomplete and that these Gnostic writings are the "lost books" of the Bible that tell a very different story about the historical Jesus. The Gospel of Thomas lacks mention of the crucifixion and Resurrection of Jesus, so the Gnostics claim that these events did not take place (what makes the view incompatible with orthodoxy). They claim that what is known as orthodoxy today merely won a "cultural war" among the different views and is not a reflection of actual events in history. Having presented this strong challenge of the Gnostic view against the orthodox view of the historical Jesus, Habermas turns to a four-pronged critique of the view. First, even if The Gospel of Thomas is accurately dated early at AD 140 and its tradition is still earlier, the gospels have all been dated a minimum of half a century earlier than even that, which places their source material closer to the events they record than the source material of the Gospel of Thomas. This means that the Gnostic gospels and the Gospels were not co-circulating at the earliest times; the Gospels were present at least fifty years before the Gnostics showed up and (as will be seen later) within only a few years of Jesus' death. Secondly, Habermas presents four standards of ancient historiography that establish the accuracy of the Gospels' historical records. This serves to hold authority over later writings that present contradictory stories (the Gnostic writings, in this case). Thirdly, based upon the testimony present in various books of the New Testament and in the writings of the apostolic fathers, we can see that the canon of Scripture was well established prior to the dates of many of the Gnostic writings. This means that Christians had recognized the earliest writings as accurate and authoritative before the greater body of Gnostic writings (and their contradictory content) were even present. Fourthly, even though the death and Resurrection of Jesus are not mentioned in the Gospel of Thomas, that is not evidence that it did not happen, especially when we have four earlier records that record that they did happen. Interestingly enough, proponents of the Gnostic view hold that the proposed document "quelle" or "Q", that is the source for the similarities among the synoptic Gospels, did not contain information of Jesus' death and crucifixion, but this is speculation as both the existence and content of the document are hotly debated. Even if they were right about the content's absence, its absence still would not argue against its actually taking place. For these four reasons, scholars generally do not consider Gnosticism a viable alternative view for the historical Jesus; Gnosticism or elements of it is vastly more popular among non-scholars. Another way to dismiss the historical Jesus (as recorded in the gospels) is put forth by people in the Jesus Seminar. The Jesus Seminar tends to see their position as a compromise between those who reject all historicity of the records in the gospels and those who take every word of it historically. Their position begins philosophically with, not just the rejection of the supernatural, but the very incompatibility of the supernatural with reality. Using this filter, they reject all records in the gospels that include any kind of non-natural event, including all experiences with Jesus after his crucifixion; however, they do tend to believe that the events that required no such non-natural mechanism are historically accurate. Habermas explains that the Jesus Seminar does not really offer as much of a "compromise" position as they like to think. The primary reason for this is before any investigation on their part has begun, they have already ruled out even the possibility of many of the historical events taking place. They have already rejected the only explanation of the events, so they are unable to perform an unbiased investigation of the historical data. With this critique in place, some Seminar scholars have pulled back on some of the extreme conclusions and have opted for agnosticism on the historicity of different non-natural events. These more moderate Seminar scholars offer several naturalistic explanations for the records of the non-natural events; however, Habermas shows how they fail to account for the historical data and/or commit various fallacies. He also demonstrates how their hypotheses are often contradicted by the historical evidence. Ultimately, he concludes that the various positions offered by Jesus Seminar scholars are not historically viable and should be rejected. Taking the reader through the many early sources, Habermas demonstrates over forty different characteristics of Jesus Christ that were both believed by the early Christians and passed down through the centuries to today. In this exercise, Habermas demonstrates that the Jesus of Christianity is indistinguishable from the Jesus believed by the earliest Christians. These orthodox beliefs were not the product of any single or series of events that took place over time; the beliefs appeared early and suddenly. Habermas also spends a considerable portion of the chapter evaluating the creed in 1 Corinthians 15. This creed is often considered to be one of the most important because it ties the beliefs of the earliest Christians to eyewitness testimony of those who walked with Jesus and had experiences of the risen Jesus. Because of this eyewitness connection, this early creed not only opens the door to historical testing of the events surrounding Jesus and the claims that He and the early Christians made, but it compels such testing. Thorough testing has been performed on at least twelve unique claims of the historical Jesus regarding the most important event: the Resurrection. That testing has revealed the facticity of those twelve claims; however, Habermas believes that only four of them are sufficient to establish the historicity of the Resurrection event. He spends a small portion of the chapter explaining this "minimal facts" apologetic, but for those who wish to go deeper into this specific historical event, check out Habermas' book "The Risen Jesus and Future Hope" along with his many other writings at GaryHabermas.com. Archaeology has provided evidence of the historical context surrounding the life of Jesus, has provided corroboration for several of the historical claims within the gospels, and may even provide compelling evidence for the Resurrection of Jesus. One of the most contested (non-miraculous) events recorded in the gospels is that of the census described by Luke. Habermas explains how archeaology has not only helped answer some of the questions this event but has also provided calibration tools for identifying the year of Jesus' death. Archaeology has also yielded much information about the ancient practice of crucifixion that corroborates reports in the gospels. For instance, the skeleton of "Yohanan," a crucifixion victim, was discovered in 1968. This particular discovery has provided information regarding the condition of the victim as they were nailed to a cross, the excruciating way a victim was nailed to a cross, many painful events that happened to the body while on the cross, and the ultimate cause of death. This data has given medical and historical researchers ways to test the claims surrounding Jesus' mode of execution and have found them to be accurate. Probably the most controversial archaeological find surrounding the historical Jesus is the Shroud of Turin. Tradition has it that this linen is the actual burial cloth of Jesus. Many visual commonalities provide a powerful case for this claim, including the blood stains that are common to victims of crucifixion and other stains that are unique to Jesus' crucifixion. The absence of evidence of bodily decomposition suggests that the victim was not in the cloth for long. And some Christians believe that the "scorch" marks that are inconsistent with foreign materials provide evidence of a resurrection. However, carbon dating has seriously challenged the identification of the Shroud with the first century AD, but even these studies have come under scrutiny due to lack of peer review and blind testing, possible contamination, and inconsistency with other pieces of evidence. Habermas explains that even if the Shroud is not that of Jesus, it could still be that of a victim who suffered a remarkably similar fate, thus still providing powerful evidence of the practice of crucifixion. He also explains that if the Shroud is, in fact, the burial cloth of Jesus, archaeologists have powerful tangible evidence not only Jesus' mode of death but the historical event of His Resurrection as well. Of all the figures in ancient history, Jesus is the most mentioned. The mentions not only come in ancient Christian writings but also in those of non-Christian sources. Habermas takes the reader through the different ancient historians' and other writers' material that mention Jesus. Tacitus, Suetonius, and Pliny the Younger are just a few. As Habermas describes these writings (and several others) and how they have been preserved in antiquity, he quotes directly from them, highlighting not just the mention of Jesus but also all the information about Jesus' life, His teachings, and His death that are recorded. He also discusses the most controversial of them all: Josephus. He quotes the disputed and undisputed texts along with a proposed "original version" of the disputed text that would be more consistent with Josephus' worldview as a Jewish historian. Habermas takes the undisputed portions along with the proposal to demonstrate several facts recorded by Josephus regarding Jesus. Habermas even cautiously uses Gnostic writings to help support certain claims about the historical Jesus that are found in other non-Christian sources. Habermas concludes from all these ancient non-Christian sources that even if Christian sources (discussed in the next chapter) are disregarded, it is established that the Jesus of the Bible existed in history and many true things can be known about Him. Of course, the ancient writings of the historical Jesus are not limited to non-Christian sources. Many Christian sources outside the New Testament were also composed and circulated. These authors included Clement of Rome, Ignatious, Justin Martyr, among others. These early sources give historians an understanding of early Christian doctrine and what the early Church believed about the historical Jesus. Habermas discusses each author that builds a total description of Jesus' life, teachings, death, and resurrection that echoes the claims of the New Testament. These records indicate that the early Church already believed what was written in the New Testament; they did not wait to see who the "winners" were regarding orthodoxy. Many people believe that the fact that these writers were Christian made them unjustifiably biased in their beliefs and that makes them unreliable sources. However, because much of their beliefs about the historical Jesus were based upon the material in the New Testament (only one generation removed, in some cases), which was shown to be trustworthy in the previous chapters, these early Christian authors were certainly justified in their beliefs. Because they were justified in believing what they recorded, their records stand firmly as a testimony of the beliefs of the earliest Christians. Having concluded a survey of the historical evidence that could speak to the historical Jesus and various challenges to his existence, Habermas succinctly summarizes what can be known from the historical evidence alone. He lists out 129 things that can be known about the historical Jesus relating to His life, work, death, and resurrection. These facts are gathered from 45 different ancient Christian and non-Christian sources. The sheer number of ancient sources that give pertinent information about the life of Jesus is more than enough to conclude by the standards of historiography that the historical Jesus is the same Jesus that is recorded in the Bible. If the Jesus of the Bible is to be separated from the Jesus of history, the entire enterprise of ancient historical studies is called into question. The Historical Jesus: Ancient Evidence for the Life of Jesus was an exciting read! I came to the book originally with many questions about what could be truly known about the historical Jesus, but as I read through it, my questions were answered. As my original questions were answered, more questions formulated in my mind that Habermas seemed to almost anticipate. It has been over a decade since my initial read through the book when these questions were answered. It was refreshing and encouraging to read through it again because over the last decade, some curiosities have come up that I had forgotten were addressed in the book. When these come up in conversation, I am now more prepared to "give a reason for the hope that I have" (1 Peter 3:15). When I first read the book in my early 20s, it was very understandable at that time (it answered my basic questions), yet it is comprehensive and deep enough to have addressed the more nuanced challenges that I have been exposed to over the years. Habermas really made the historical facts come to life for me and give me a more connected feeling to the actual events of history. This not only excited me but gave me a profound sense of satisfaction that my belief is justified true belief, justified by the evidence of history. If you are having serious doubts about the historical Jesus, you definitely need to get this book. And if your church has a library, it needs to be on the shelf for those who have these deep questions and are honestly looking for answers. For any Christian who regularly discusses the truth of Christianity (that should be all of us), you also need this book. It will give you a resource to always be prepared to answer both the basic and the deeper challenges of those who are skeptical of the historical foundations of our worldview. Nearly two thousand years ago, the Apostle John proclaimed, "The Word (Jesus) became flesh and made his dwelling among us. We have seen his glory, the glory of the one and only Son, who came from the Father, full of grace and truth," and history bears a fantastic witness to this truth.